On Sunday, July 15th, Uada brought their Snakes and Vultures Over North America tour to Deep Ellum. An early 6:00PM start allowed for the touring bands to load in during the heat of the day and embrace the 102 degree Texas summer. This set the stage for a night of unrelenting, atmospheric, and misanthropic performances. The tour package also included Wolvhammer and The Black Moriah. The show was rounded out with North Texas bands, Wyrm Chasm, A Devil’s Daydream, and Black Aveum. The six band roster made it easy for fans to rub elbows with the rockstars at the local watering hole for metal heads, better known as Reno’s. The show kicked off at 6:25PM with the three local openers blasting and shredding through 30 minute sets as fans continued to trickle in throughout the course of the night. The energy continued to grow from one set to the next as the anticipation of the touring acts was evident. The Black Moriah @ Renos, Dallas, TX. Photo by Corey Smith. Around 9:00 PM, The Black Moriah took the stage. This stop on the tour was a quick welcome home for the North Texas natives before getting back on the road. 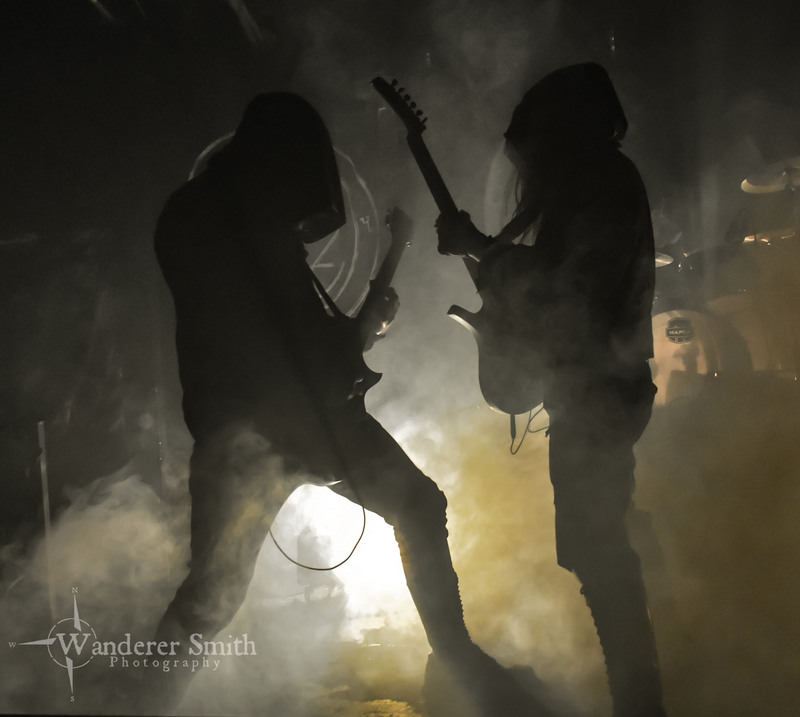 Founding members Zawicizuz (Guitars, Vocals, formally in Absu), and The Mad Arab (vocals, drums) led the charge as the band presented their unique form of metal that paints a picture of the old west. Leather boots, cowboy hats, and bandanas were the attire for The Black Moriah, as they embodied the spirit of western outlaws. The revolving door of member changes as of late hasn’t derailed the road agents from moving forward and kicking up dust. One could almost hear the sounds of hooves as Joey Gonzalez (drums) and Alejandro Sacripanti (bass) provided the metronome-like rhythm for the set. Steven Flores (guitars) solidified the overall atmosphere with an in-your-face stage presence and undeniably well-executed riffs. The band delivered a set consisting of all new songs that have not yet been released. I have no doubt that when the day comes for a new release that it will be the best offering to date from the road agents. Wolvhammer @ Renos, Dallas, TX. Photo by Corey Smith. Once the dust settled, Wolvhammer took the stage. They provided straightforward, aggressive, and unapologetic music that stirred the crowd. The band is currently on tour supporting their most recent release, The Monuments of Ash and Bone. For this tour, Wolvhammer had a guest vocalist by the name of Ken Sorceron. Some would recognize him from Abigail Williams, or a host of other projects. Despite some deafening feedback through the monitors at the start of the set, I was truly impressed with the performance. The energy that the band released turned the floor in front of the stage into a whirlwind of flying hair and a small, yet passionate mosh-pit. The band and crowd fed off one another as Wolvhammer unleashed an assault of blackened death that helped numb the senses. What seemed like a twenty minute set left the crowd wanting more. The hard work and dedication of this band showed as they demonstrated that they can adapt to the change of session musicians flawlessly. Uada @ Renos, Dallas, TX. Photo by Corey Smith. The time was near for the the hooded entities that are Uada to take the stage. The band is touring in support of their sophomore album, Cult of a Dying Sun. Released on May 25th, 2018, this album promises a bright future for this four piece. The scent of sage delighted the senses and a dense fog blanketed the room. Wolves howled on an atmospheric sound sample that were echoed by those in the crowd as we waited for the members to take the stage. The hypnotic set consisted of tracks from the new album that included the title track “Cult of a Dying Sun,” “The Purging Fire,” and of course, “Snakes and Vultures.” A truly mesmerizing stage presence, coupled with distinctive song structures, and some of the best black metal vocals I’ve heard in quite some time, made for a performance that the crowd will not soon forget. The melodic, atmospheric, and hypnotic set was everything that I wanted and then some. Uada is raising the bar for the new era of atmospheric black metal and it will be hard to reach. Do yourself a favor and pick up the new album and see this band live if you get the chance – you won’t be disappointed.